17 July 1392 - Joseon's founding. The House of Yi, also called the Korean Imperial Household or Jeonju Yi clan, was the household of Joseon and the Korean Empire, consisting of the descendants of Yi Seonggye, the founder of Joseon, known by his posthumous name, Taejo ("highest ancestor"). All his descendants are members of the Jeonju Yi clan, including the imperial family of the Korean Empire (1897–1910). After the Japan–Korea Treaty of 1910, in which the Empire of Japan annexed the Korean Peninsula, some members of the Yi clan were mediatised into the Imperial House of Japan and the Japanese peerage by the Japanese government until 1947, just before the Constitution of Japan was promulgated. Since then, their status as royalty has not been acknowledged by any country; however, they continue to attract occasional media attention in South Korea. This happened most recently with the July 2005 funeral of Yi Gu, former head of the royal household. At present, three members claim themselves as heirs to the throne. Yi Won, a first cousin and the son of the 9th son of Prince Ui, has posthumously adopted as son of Gu by the house members' decision, thus regarded as de facto head of the house. Yi Hae-won, his aunt and second eldest daughter of Prince Ui, was declared as the empress by some of the house members at 2006. Yi Seok, another son of Prince Ui, leads independent imperial restorationist organization and recognized as an heir. Another member has claimed to have visited the United States, and have attended college in Irvine, California. In the 19th century tensions mounted between China and Japan, culminating in the First Sino-Japanese War. Much of this war was fought on the Korean Peninsula. Japan, after the Meiji Restoration, acquired Western military technology, and forced Joseon to sign the Japan–Korea Treaty of 1876. Japan encroached upon Korean territory in search of fish, iron ore, and natural resources. It also established a strong economic presence on the peninsula, heralding the beginning of Japanese imperial expansion in East Asia. The Chinese defeat in the 1894 war led to the Treaty of Shimonoseki, which officially guaranteed Korea's independence from China. The treaty effectively granted Japan direct control over Korean politics. The Joseon court in 1894, pressured by encroachment from larger powers, felt the need to reinforce national integrity and declared the Korean Empire. King Gojong assumed the title of Emperor in order to assert Korea's independence by putting himself on the same level as the Chinese Emperors. In addition, other foreign powers were approached for military technology, especially Russia, in order to fend off the Japanese. Technically, 1894 marks the end of the Joseon period, as the official name of the state was changed; however, the dynasty continued, albeit perturbed by Japanese interventions. For example, the 1895 assassination of the emperor's consort, Queen Min, apparently orchestrated by Japanese general Miura Gorō because the Korean empress was effective in keeping Japan at bay. In 1910, the Japanese annexation of the Korean peninsula effectively ended rule by the House of Yi. The collapse of the Russian navy in the historic battle of Port Arthur (in which the Russian Imperial Navy was destroyed in a decisive surprise attack), led to a great weakening of Korea's umbrella of protection. The combined effect on China of the opium wars in the south and Japanese naval strikes in the north increasingly led the Japanese to see Korea as a strategic foothold leading into northern China, just as Macau and Hong Kong had been Portuguese and English trade enclaves, respectively, in southern China. In a complicated series of manoeuvres and counter-manoeuvres, Japan pushed back the Russian fleet in 1905 (see Russo-Japanese War). Both the fleets of China and Russia had given Korea sufficient protection to prevent a direct invasion, but this ambuscade of the Russian fleet gave Japan free rein over north China, and Korea was left at the mercy of the new regional naval power Japan. Korea became a protectorate of Japan in 1895 when Japan forced Emperor Gojong to abdicate and Japanese assassinated his consort. Japan annexed the country in 1910, and Korea became a colony of Imperial Japan. During the colonial rule, the members of Yi family were mediatised into the royal family (王公族, Ōkōzoku) or made Korean nobles (朝鮮貴族, Chōsen-kizoku). Korean Imperial family. This circa 1915 image is a compilation of individual photographs taken since the Japanese did not allow them to all be in the same room at the same time, and some were forced to leave Korea. 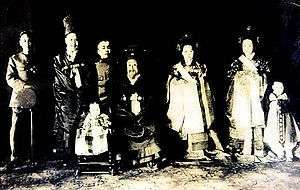 It shows the following royal family members, from left: Yi Kang, the sixth son of Gojong; Sunjong, the second son and the last monarch of the Korean Empire; Yi Un, the seventh son; Gojong, the former King; Empress Sunjeong, queen consort of Sunjong; Deogindang Gimbi, wife of Prince Ui; and Yi Geon, the eldest son of Prince Ui. The seated child in the front row is Princess Deokhye, Gojong's last child. Emperor Gojong had nine sons and four daughters, but only three princes, as well as one princess: the second son, Crown Prince Cheok; the sixth son, Yi Kang, and the seventh son, Yi Un. The second son, Cheok, became Emperor Sunjong, the last monarch of the Korean Empire. Since Emperor Sunjong died without issue, his younger brother, Prince Eun became the crown prince. His elder brother, Prince Kang, should have taken the position, but was passed over because Eun's mother, Princess Sunheon, had a higher status in the court than Gang's mother, Lady Chang. After Emperor Sunjong died in 1926, Crown Prince Eun was called "King Yi of Korea", a nominal title because the country had already lost its sovereignty to Japan. Crown Prince Eun married Japanese noblewoman Princess Masako Nashimoto, who is known as Yi Bangja, a member of the Miyake cadet family. Some Koreans accused Japan that Princess Bangja, once one of three candidates considered to for the bride of the Japanese emperor, was instead designated as Eun's wife because a medical test indicated she could be barren. As a result, some media claimed the arranged marriage was Japan's imperialist conspiracy to terminate the Korean imperial lineage. 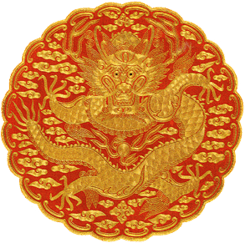 However, Princess Bangja gave birth to Yi Jin in 1921 and Yi Gu in 1931. After Korea's liberation in 1945, President Syngman Rhee suppressed the imperial family in order to prevent the restoration of the monarchy as he feared that its return would challenge his emerging authority as the new republic's founding father. Rhee seized and nationalized most of the family's properties. The imperial family also had to shoulder the psychological and historical burden of their ancestors' responsibility for the "collapse of the nation". Stripped of most of their wealth and authority, some fled to the United States and Latin America. In addition, many of the former members of the Gaeseong branch of the family had their lands repossessed and were forced to leave Korea after the military/republican government took hold in the South. Known descendants currently reside in New Jersey and New York, one of which married the daughter of a former Italian Duchess. Ironically, Syngman Rhee himself was a 16th-generation descendant of Taejong of Joseon. It was only in 1963 that a new president, Park Chung-hee, allowed the imperial family, including Princess Deokhye, to return to Korea. However, they could only stay at Nakseon Hall, a small residence in a corner of Changdeokgung in Seoul. Crown Prince Eun died seven years later after a long illness resulting from strokes. Yi Gu was forced by other family members to divorce his American wife, the former Julia Mullock, in 1982 due to her sterility (the couple, however, had an adopted daughter). A series of business failures left Prince Gu without support, and he died alone at the Grand Prince Hotel Akasaka in Tokyo on July 16, 2005. The site of the hotel had been his birthplace 74 years prior. Emperor Gojong's sixth son, Prince Gang, fathered 13 sons and 9 daughters by 14 women. With an extremely wide range of historical evaluations over him—womanizer and behind the scenes leader of the independence movement—the Japanese authorities limited the activities of the prince throughout the occupation. President Syngman Rhee's seizure of the imperial properties deprived Prince Gang of most of his wealth. According to the prince's 11th son, Yi Seok, his mother, Hong Chongsun, was forced to sell noodles as a street vendor to make a living. In 1998, it was reported that Prince Gang's eighth son died alone in a social center in eastern Seoul. The eleventh son, Prince Seok, is a lecturer at the Jeonju University as of 2005. Among Prince Gang's surviving four sons and seven daughters, four lost touch with the family after they left for the United States. The other family members hold an ancestral ritual two times a year for Prince Gang, but usually only two or three of the 11 surviving siblings attend the ceremonies. Amy Yi, a granddaughter of Gojong, migrated to the United States in 1956 and worked for 27 years as a librarian at Columbia University in New York City. In September, 2012, she was 82 years old and described as "one of the last survivors of the Korean royal court". Yi Chung (born 1936) is the genealogical male-line heir of Emperor Gojong. He is the eldest son of Yi Wu, who inherited the title "Prince Heung" with the fourth head of Unhyeongung and his wife, Princess Chanju, a granddaughter of marquess Park Yeonghyo, who was a son-in-law of Cheoljong of Joseon. At the age of nine, Prince Heung inherited Unhyeongung, where Emperor Gojong was born, after his father died in the atomic bombing of Hiroshima. In 1947, his father's elder brother, Prince Gun (Momoyama Ken'ichi), acquired Japanese citizenship. This change of citizenship made Prince Chung the direct heir of his grandfather, Prince Kang, who died in 1955. On 1991, after the death of his mother, Prince Chung returned his ancestral home of Unhyeongung to the Seoul city government. At present, Prince Chung is the de jure genealogical heir to the headship of the Imperial family when male primogeniture is applied. However, he has not taken an active position on the debate between leadership of Imperial family between his two relatives, Prince Won (a first cousin and the son of the ninth son of Prince Kang) and Princess Haewon (aunt of Prince Won and second eldest daughter of Prince Kang). Titularly reigning since the death of her predecessor, Yi Gu, Prince Hoeun, on 16 July 2005, Princess Haeweon was enthroned as symbolic monarch of Korea on 29 September 2006 by the Korean Imperial Family Association, organized by about a dozen descendants of Joseon Dynasty. She lays claim to the title of Empress of Korea and declared the restoration of Imperial House in her own succession ceremony. The private enthronement was not approved or supported by the republican government of South Korea. At present, there is no official recognition title conferred to the head of Korean Imperial Household by the Korean republican government. Nevertheless, it is assumed that the current title held by the present enthroned descendant Princess Haewon, titular Empress of Korea, is "Her Imperial Highness", although Prince Chung is the head of the household inherited from his father by male primogeniture. 1 2 Yu-Mei Balasingamchow; Simon Richmond; Cesar G Soriano; Rob Whyte (1 May 2010). Korea 8. Lonely Planet. p. 37. ISBN 978-1-74104-831-5. Retrieved 3 January 2013. ↑ Pae-Yong Yi; Ted Chan (2008). Women in Korean History 한국 역사 속의 여성들. Ewha Womans University Press. p. 190. ISBN 978-89-7300-772-1. Retrieved 3 January 2013. 1 2 AP (September 14, 2012). "SKorea regains old embassy in US, snipes at Japan". The Philippine Star. Retrieved 30 September 2012.